I absolutely love combining granola and yogurt to make what is known by some as a yogurt sundae! But, because granola tends to be so high in calories and fat, I've pretty much removed it from my diet. Not eating granola has become especially challenging for me lately, as Jamba Juice (which I both love & frequent) has added a yogurt granola "smoothie" to their menu (not low calorie, but looks delicious). So, the other day I left Jamba Juice on a mission to find a granola that I could eat a small portion of at home, without having to feel guilty. Next time I went to Whole Foods, I went straight for the granola aisle (a place I had previously avoided). One of the first low calorie granolas I found was called Galaxy. But, a few years ago, there was an issue when their nutritional information came under question, and they actually had to increase the number of calories on their light granola. So, knowing I'd still question the calories if I bought it, I passed it up. I later found a granola (on the lowest shelf just as I was about to give up) by a company called Enjoy Life, a brand known for their gluten free foods. Although I had never tried their products before, I decided to buy the Cinnamon Crunch flavor which had 160 calories (with 5 grams of fiber, and 3 grams of protein) for a half a cup serving -- 3 weight watchers points for a whole serving, but only 1 WW point for half a serving. This was one of the lowest calorie and lowest fat granolas I found, so I decided to try it and take it home for a taste test. I combined half a serving of the granola with some fage yogurt, and a small portion of frozen blueberries & a few walnuts, for a really yummy 4 WW point (around 215 calories) weekend breakfast. The granola is really crunchy (it is in big clusters) and is admittedly a bit different than regular granola (less oily & no nuts), but the difference can be expected given its reduced calorie and fat count. The best news is that the granola enabled me to *totally* satisfy my yogurt sundae craving and has made it possible for me to eat granola guilt-free again, which makes me really happy! 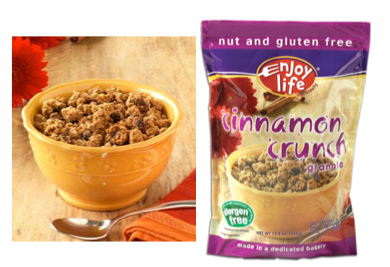 The Enjoy Life Granola is nut free and is available in three nut free and gluten free flavors: Very Berry Crunch, Cinnamon Crunch, and Cranapple Crunch. The granola is also dairy free, egg free, fish free, and soy free (thought I'd mention it in case those ingredients matter to you). They have a nice store locator on their site. Given how much I like the granola, I think I'll be trying more of their foods going forward so stay tuned! PS. If you are looking for another granola option, check out my posting on lizi's granola as well -- another great granola option.